SBI Mutual Fund (MF) has unveiled a new fund named as SBI MF Debt Fund Series B - 42, a close ended debt scheme. The tenure of the scheme is 1100 days from the date of allotment. The New Fund Offer (NFO) price for the scheme is Rs 10 per unit. The new issue will be open for subscription from 11 July to 14 July 2016. The scheme offers regular and direct plan. Both the plans will have growth and dividend option. 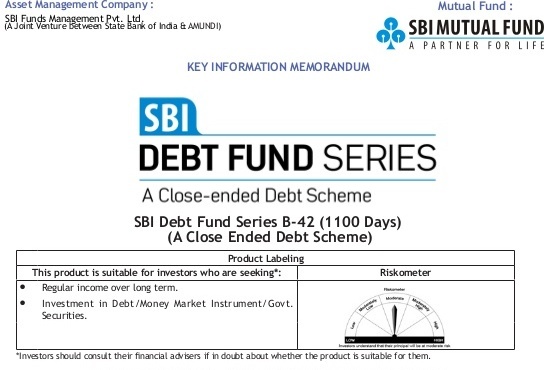 The scheme will invest 70% to 100% of assets in debt and invest upto 30% of assets in money market securities with low to medium risk profile. Exposure to domestic securitized debt may be to the extent of 40% of the net assets. The minimum application amount is Rs. 5,000. The units of the scheme will be listed on BSE in order to provide liquidity. The fund manager of the scheme is Rajeev Radhakrishnan.